Random And Some: "For all its glories, baseball is a brutal business"
"For all its glories, baseball is a brutal business"
In the car ride coming back from our snowboarding trip in the Dolomites, I read Good Enough To Dream (1985) by American writer, sports editor and editor-at-large Roger Kahn, who was inducted into the National Jewish Sports Hall of Fame in 2006. I stumbled upon the book when I was assembling my Christmas wish list late last year, going through many notable sports books. A lot of them looked awesome, like George Plimpton's Paper Lion, Rick Telander's Heaven Is A Playground and H.G. Bissinger's Friday Night Lights, but Good Enough To Dream stood out the most. 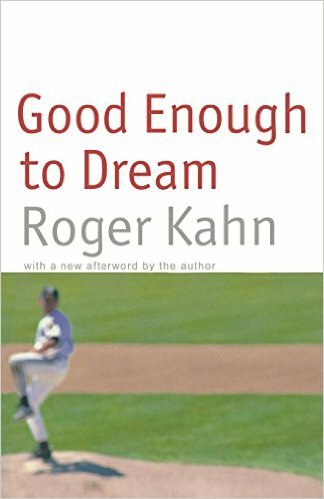 Good Enough To Dream is the story of Kahn's year as owner of the Utica Blue Sox, a Class A team of the New York-Penn League. As an unaffiliated, independent team made up completely of misfits who will almost surely never make the majors, we follow Kahn's underdogs, both on the field and in the front office, as they chase the pennant for 12 weeks. I absolutely loved Kahn's writing and I loved this book. There's so much here about the ins and outs of owning a minor league ball club here, and it makes for a very fun read. Good Enough To Dream is almost a love story to the Utica Blue Sox, presenting a funny and poignant sotry of one season and one special team.